Researchers of Carreira & Alegre have presented the TangIn project draft educational resources at the European Researchers Night 2018 in Aveiro, hosted by Ciência Viva and in Porto, hosted by INOVA+. On the last Friday of September 2018 the European Researchers Night 2018 took place in dozens of cities all over Europe, aiming to promote science and technology to civil society and showing how science impacts and contributes to everyday life. The event was a perfect moment to showcase the educational resources and how they can be used in primary school education. 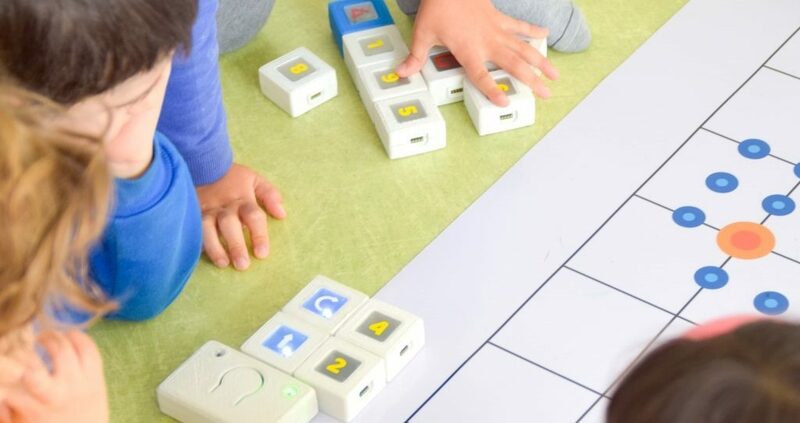 Researchers o Carreira & Alegre have demonstrated to young kids and their parents how to use programming to learn mathematics and science school topics. Furthermore, the project was also disseminated at the Porto event organized by INOVA+ at Palácio das Artes and Museu de Serralves, with the distribution of the last edition of the project newsletter. If you are interested in participating in the TangIn project or if you would like additional information, you can do so by contacting Pedro Costa at pedro.costa@inova.business. TangIn is co-funded by the Erasmus+ programme of the European Union. TangIn – changing the vision of the curricula content in primary school. The third project newsletter is out!